Looking for a USED KIMI A1 CNC? 1. 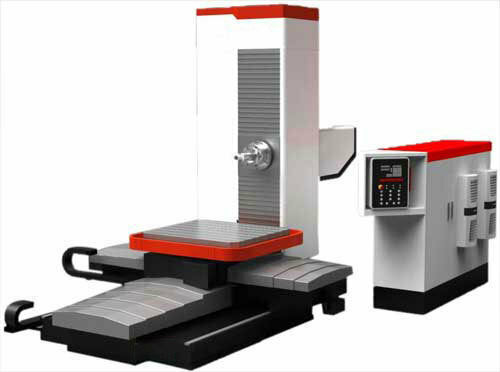 KiMi A1 CNC Horizontal Boring and Milling Machine headstock is composed of spindle component, gear box, feed distribution system of spindle and facing head slide. Spindle system adopts facing head spindle, hollow spindle and boring spindle three-layer structure. Spindle bearing adopts high precision and rigidity tapered roller bearing; tool is clamped by disk spring and released hydraulically. Boring spindle material is 38CrMoAIA after 30 working processes and surface grinding and polishing. 2. Main motor adopts AC adjustable-speed motor, spindle speed infinitely variable. 3. Each feed axis adopts independent AC servo motor to drive the ball screw. 4. X, Y, Z axes adopt FAGOR grating scale to form closed-loop control, and precision is stable and reliable. 5. Column is fixed on the bed with two rectangular guideways. 6. Worktable surface is square box type with high anti-bending and torsion capacity. 7. Bed thickness is 450mm; span of main and auxiliary guideway are respectively 1000mm and 2100mm; semi-closed resin sand casting provides good supporting rigidity. Looking to Purchase a New FORTUNE PACIFIC KIMI A1 CNC?